If you remember last time I showed the top of this thigh I had paused my quilting to add some more detail to the arm behind it. Now you can see what I meant. There is a shadow on the arm and her bracelet. Pausing when I did just made for a tidier edge. 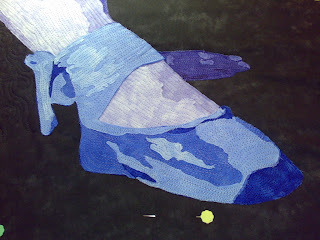 When I was working on the lower legs I also made use of the thread to do the feet. It saved a couple of thread changes at least. One of the downsides of doing this sort of work (and especially the way I approach it) is the number of thread changes. It's surprising how much time and thread that eats up. Once I had the bulk of the body quilted I went looking for threads for the shoes. Would you believe I had trouble matching those as well? I really think Moda need to bring out a range of threads to match their fabrics. 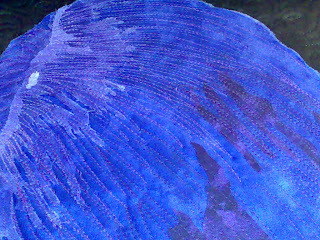 I've got a lot of thread but I could only get close to two of the blues. I had an almost perfect match for the second lightest and decided to use that on the palest areas as well, after all those are just highlights right and using the slightly darker colour will just add detail. The other shade I could match fairly well was the darkest although to be honest my thread was a little dark. I couldn't just leave the mid blue unquilted but I didn't have a blue thread even close. So I tried grey. I use a lot of grey as most of the time it blends in really well with other colours. Unfortunately I had a little too light and a little too dark and it didn't want to play ball. Fortunately luck came to my rescue. I looked at the machine. The purple it was loaded with at that moment was very blue looking, and about the right shade. Amazing it's a pretty close match and was right in front of me. I did swap the bobbin thread I used with it so if the bobbin did show at all it would add blue to the mix not purple. I used about 15 threads in this quilt and I really didn't have enough. I will be looking to extend my collection sooner rather than later. 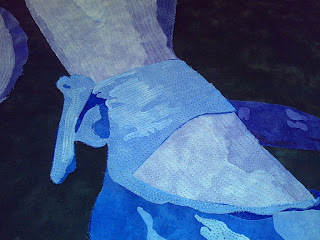 I really enjoyed working on the shoes I think the quilting probably adds more to them than any area other than the hair. 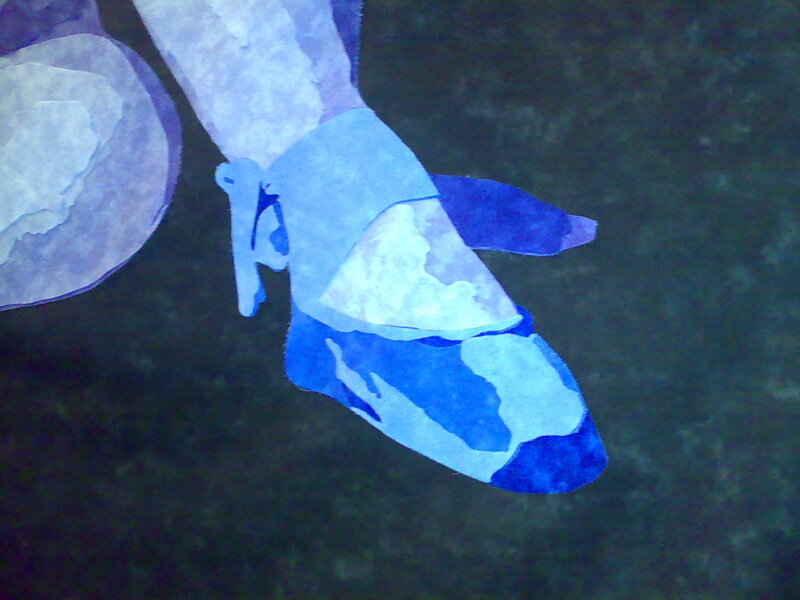 Suddenly you can see the ribbons and the curves of the feet. 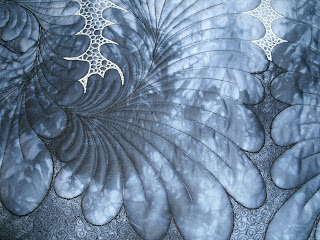 In this picture you can also see that the background quilting has more or less kept pace with the rest of the quilt and in the one below why that is so important. The body quilting really does draw in the quilt a lot and if the fullness in the background is just left it becomes really difficult to quilt in without tucks despite the fact it is all one piece of cloth so we know it must have fitted once. 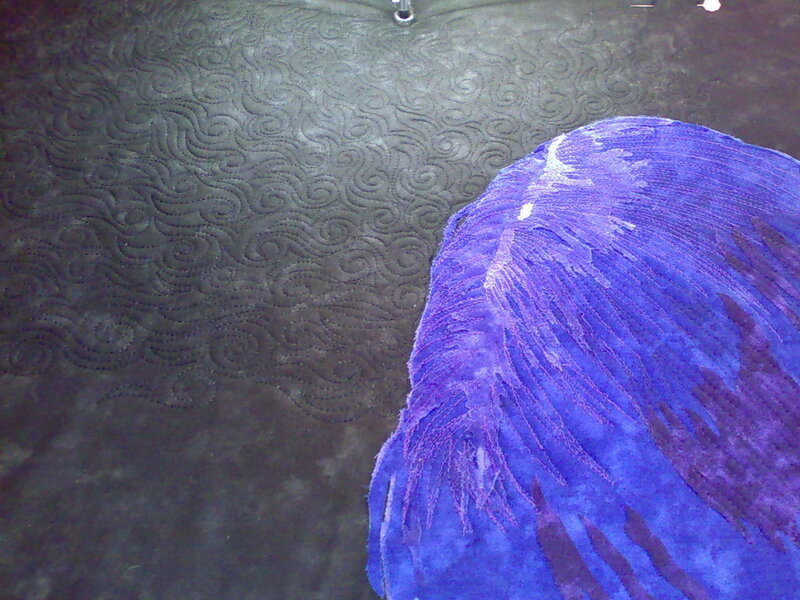 As I said at the beginning I did roll back and take another look at the hair before I unloaded the quilt. I decided I couldn't add any more quilting. 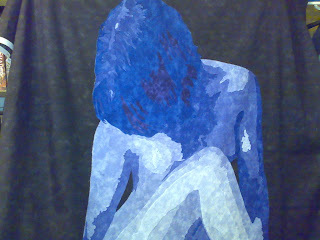 The quilt had enough distortion already I didn't want to add more. 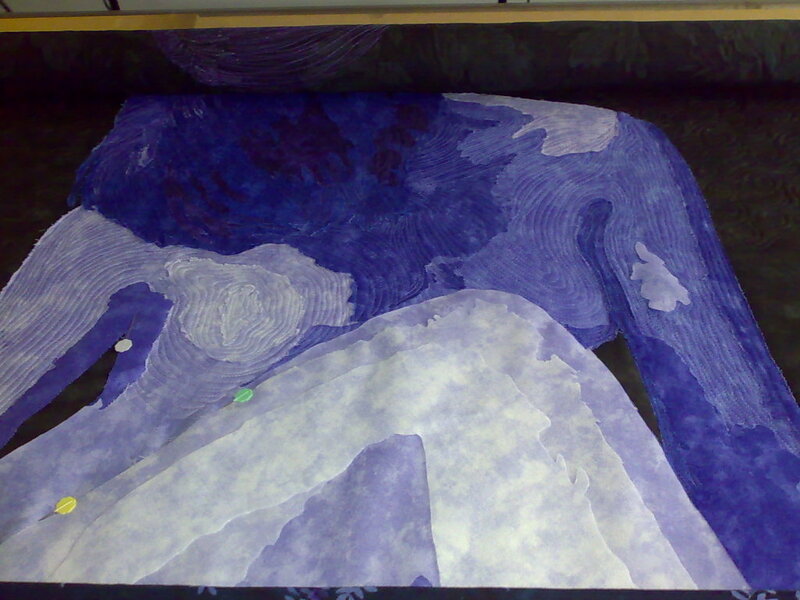 It is now pinned out being blocked to flatten everything before I trim it up. I've made the thumbnails a bit smaller today because I wanted to share more pictures that usual, you can still click on them to get the full size images. 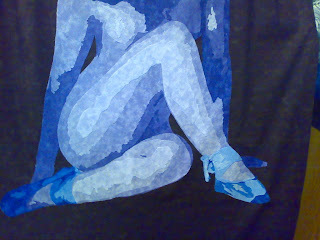 The legs seemed quite simple at first glance then as I thought about it more I realised how much was actually going on that wasn't being shown by the shades of the fabric. 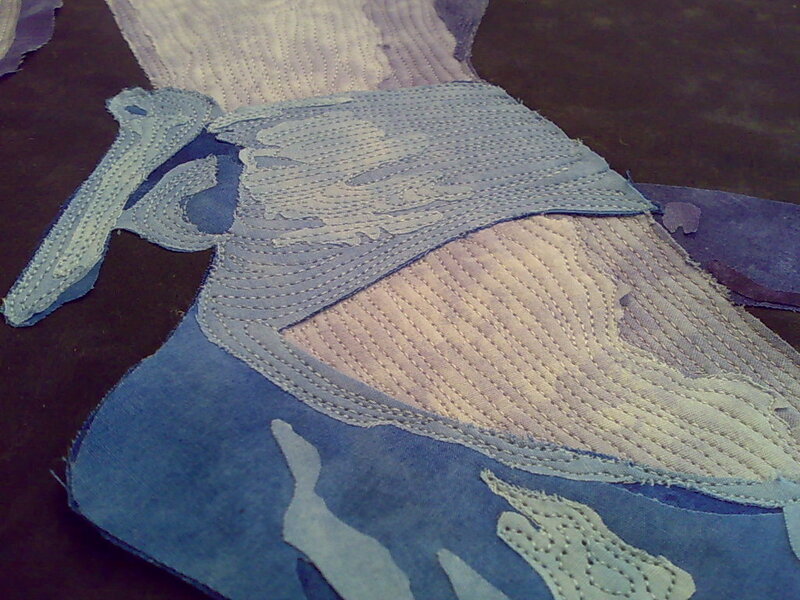 The most obvious area was where the top leg met the arm, both were the same colour and needed to be separated by the quilting. 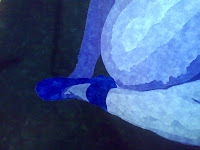 There are many more subtle areas too, the knee for example needed some sort of transition as did the lower leg and body. As ever I started where I could see what was going on with the highlights on the muscles. I was trying to both follow the underlying contours of the leg and the shape of the fabric. It did mean making some compromises but it came together. The next lightest shade on the top leg was also fairly easy to deal with, although I had to start thinking about the fold in the leg, with this colour. By the third shade I was clearly coming up against the crease behind the knee, but more importantly I spotted some details I wanted to add to the arm. In one of the pictures you can just see a couple of pieces of paper off to the side. 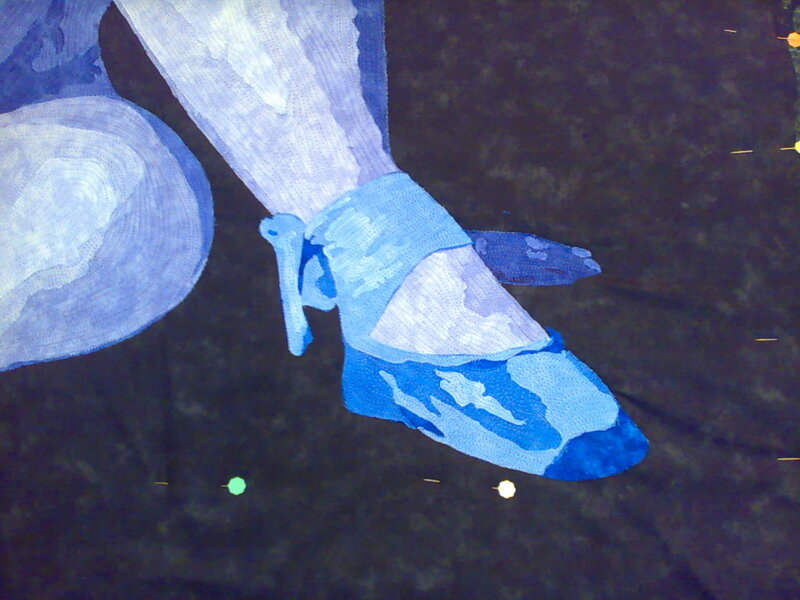 I stopped here to work out what needed adding and decided I needed to leave that area of the leg until I had put some more detail on the arm so I could tuck in the edge of fabrics that were supposed to be further back. It's amazing how often quilting past something can point out a problem with it. I left that for later and went on the lower part of the leg. By comparison this bit is easy. There are some fiddly narrow pieces to control but at least the shape is clear and simple. 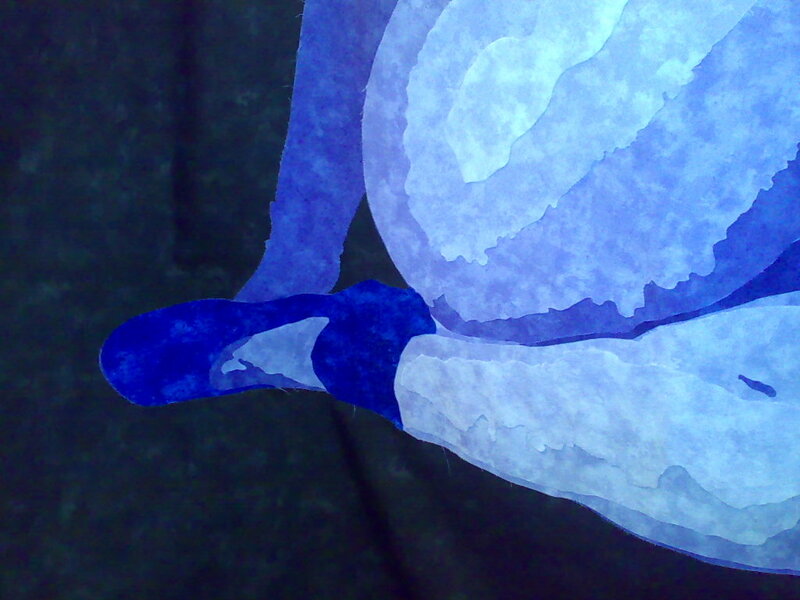 You can see in this area what I meant about the arm and the leg trying to blend together. You might also notice that in some places there is a lot of fabric to persuade into quite small places. 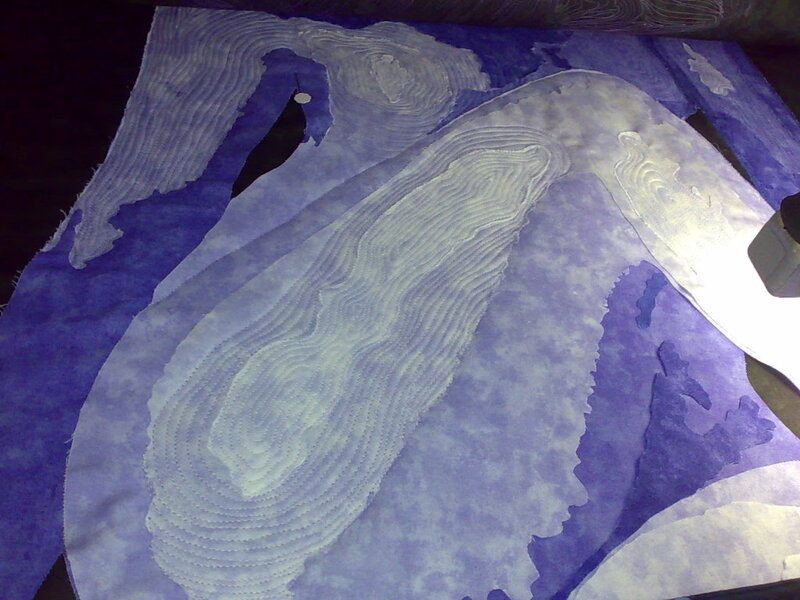 As I am quilting fairly densely the quilt is drawing up as I go so pieces further down seem to big to fit. They will but the need a lot of coaxing. Its one of the reasons I longarm one handed. I use my left hand to manipulate the fabric as I work in just the same way I did on the domestic machines. It worked there right so it must work here, and it does. It also scares people when they see me doing it. 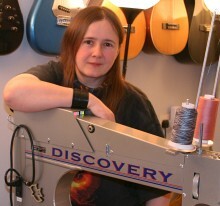 I do have my fingers very very close to the foot of the machine, I have to if I am manipulating small pieces. Yes it is possible to sew through your finger but mostly I get hit by the needle screw, it hurts but it lets me get the fabric to do what I want. The lower leg is again more of a challenge than I first thought. 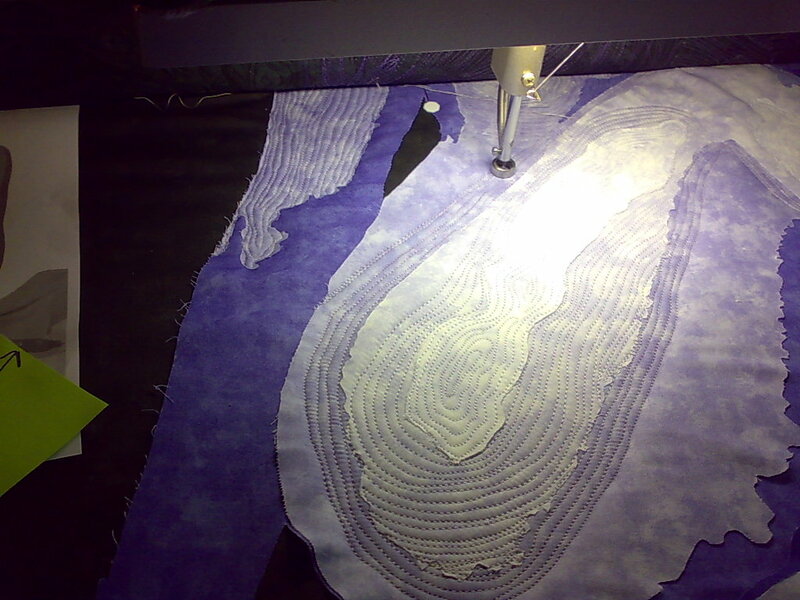 The tiny piece of dark fabric is the where the calf muscle is pressing against the thigh, so again the quilting needs to change direction there to provide the appropriate shape. It is also a good example of silly little things that are critical to the overall design. 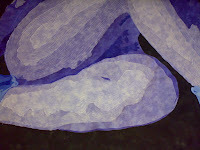 When I am teaching my art quilt classes I do talk a lot about small things that matter and small things that don't. I try to explain how to tell the difference because there is no way to make a list of them. This may not seem important but trust me if it wasn't there you would know it was wrong. 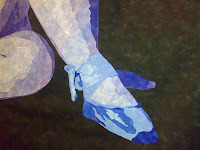 While I am working on the quilting I have a print out of the image next to me. I use this for two things. The first is to allow me to keep checking the fabric pieces as I go along. and certainly on this quilt there has been quite a lot of editing as I have quilted. I am looking for places where the pieces are the wrong shape or colour or are completely missing. There are usually a few bits I failed to trace at some stage and others that have gone missing during the cutting so the constant reference to the printed image is really important. 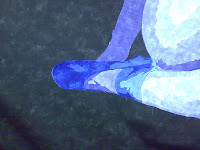 The other use for the image is to translate the strange shapes into a human. It's hard enough to tell what the fabric represents in the photographs, but trust me it is far harder in real life and it is one of the reasons I always take a lot of pictures they help. Once I have worked out what the fabric is trying to show I can try and figure out which way the the quilting lines need to go to improve the image. Fortunately with humans I do at least have a sample on hand. You can feel your own shoulder and feel where the bones are. I've done different styles of quilting on different quilts but for this one I am trying to have the quilting follow the body structure. It's fiddly but it seems to work quite well. The collar bone was fairly easy to deal with and the indentation next to it. The central section of the chest was harder to sort out so I decided to start work on the opposite arm instead. I tend to jump about a lot. When I can see what needs to be done on an areas I do it, and come back to the trickier pieces. Sometimes the tricky bits have vanished in the easy bits which is always nice. The pins in the quilt are marking transitions to give me some guidelines. 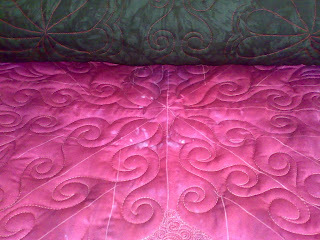 Quite often one shade of fabric will span multiple body parts and for this quilt I want the quilting to separate them. I like to use pins for marking as they are easy to remove. I've had enough bad experiences with marking tools I try not to use them at all now. You can see on the arm how I have followed the line of the arm but also the shape of the fabric. I don't want to use the same colour thread on the two areas. If I did the thread would be very visible on one of the fabrics, which could make it too invasive. 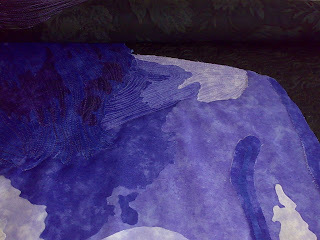 The thread may also reduce the contrast in the shades of the fabrics. Sometimes that can be helpful, but on the whole I want the best match I can get. On this quilt I had some problems choosing the palest fabric. It wasn't really as pale as I would like, so the thread I used on it is bright white, just to lift it a little. I applied the same principles for the top of the other arm and quilted a bit more of the background. 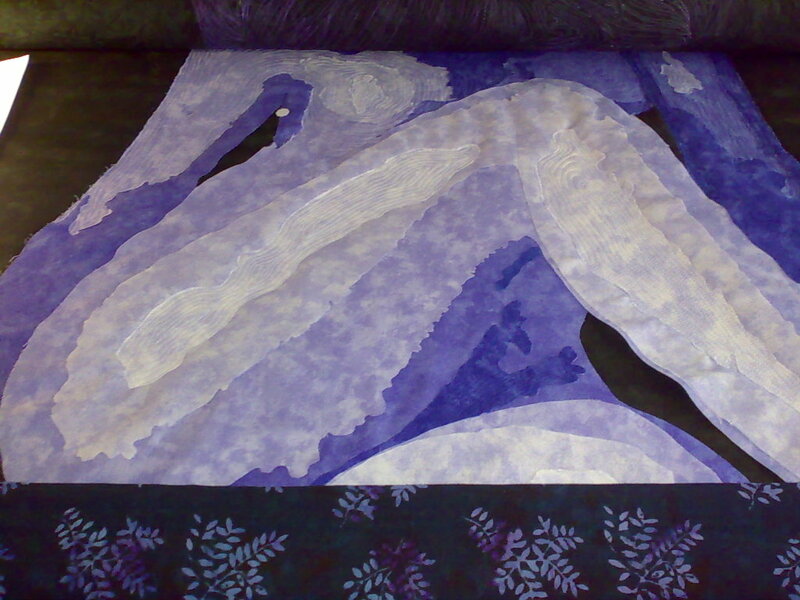 Mostly the background is keeping pace with the quilting on the image. First let me say it is very very difficult to photograph the quilting when it matches that fabric and the quilt is still on the frame, but I've done my best. Hopefully if you click on the images you will get the idea. 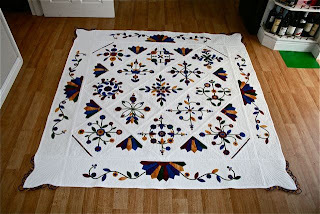 As I think I mentioned in my last post about this quilt I had some problems finding the right colours of thread. After turning the house (and van) upside down I did find a few more. I found far more that were the wrong purples though. Of course all the threads I really wanted to use didn't want to play ball. Some of them I have never managed to get to run on my machine and I really should get around to either chucking them out or rehoming them before I waste more time playing with them. I did try them and I did fail. After a lot of fiddling I did persuade masterpiece to run provided I kept the speed right down, which for me, quilting hair just wasn't going to work. 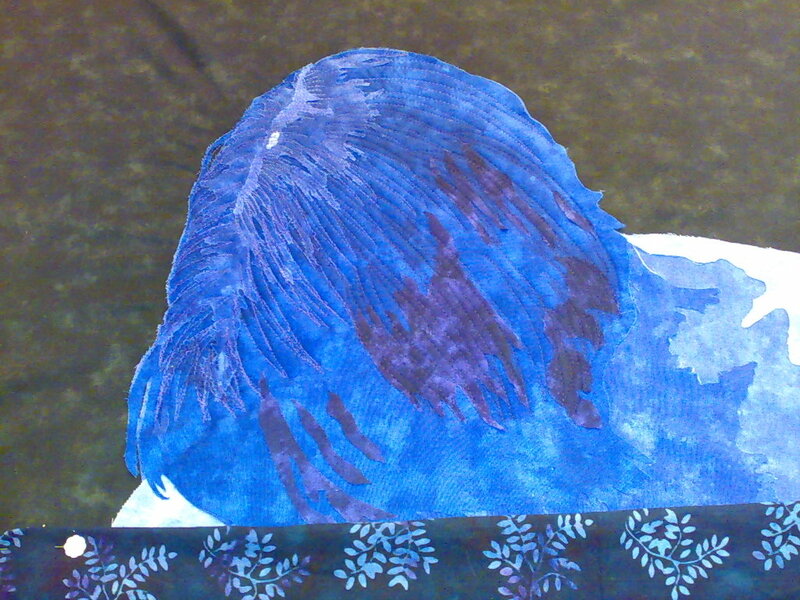 I think hair is my favourite part of quilting people. 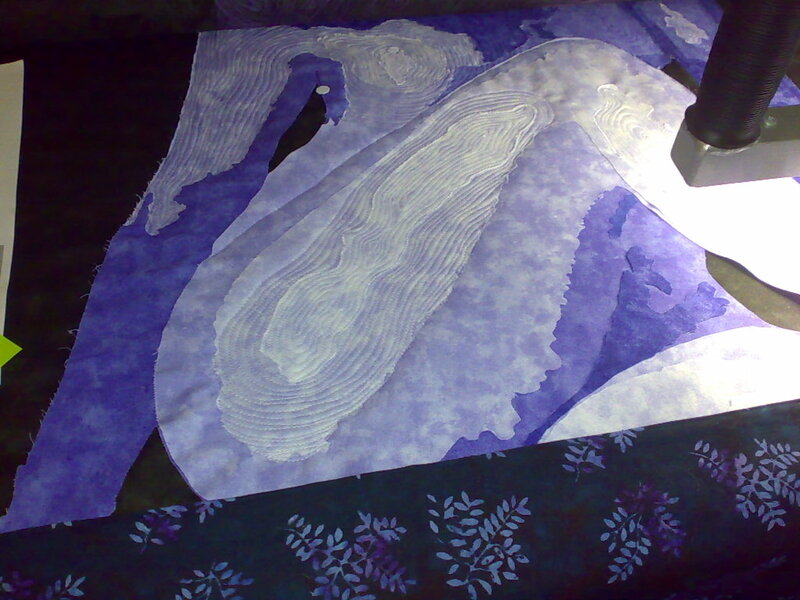 It's the easiest for me so work out what I am doing and it tends to flow better than other areas of the quilt. I can also be more flexible with my thread colours as I want to blend the fabric shades more in the hair than anywhere else. I started with the darkest thread to start getting the direction of the hair in place. The dark thread was the one happiest running at speed which made it easier for me to get the flow right. From there I could work on the mid shades. These had to be stitched slower, which I found hard, but possible once I had the dark lines in place to keep me going in the right direction. 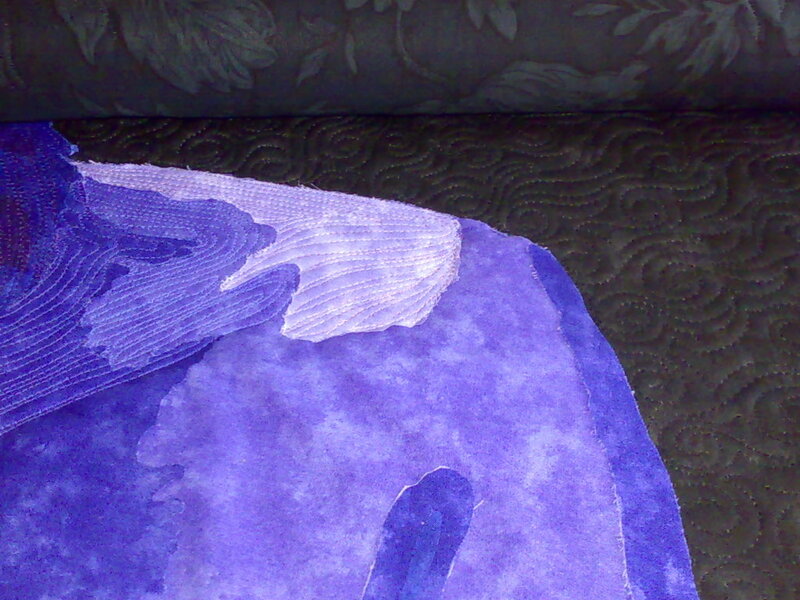 I was also looking to secure as many of the raw edges as possible at this stage, it makes the quilting easier later. 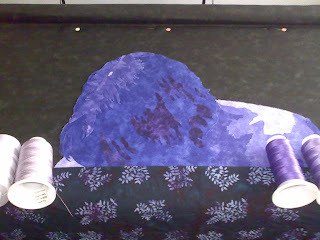 As you can see in the firs picture as soon as I start quilting the hair it draws in the quilt. This can leave me with a lot of fabric to ease in in the background. I deal with this by doing a bit of background quilting every so often. It not only keeps everything in place and behaving but it gives me a rest too. 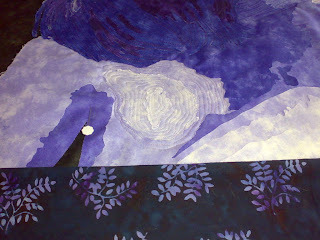 The background is quicker more flowing quilting that I don't need to think too much about. Yes, I often do a bit of it when I get stuck on something on the main image, or indeed when the threads annoy me too much. I build up the quilting on the hair in stages. I want it to be ver clearly hair but I can't quilt it too densely or it will distort the quilt even with the uber wadding in it. I worked on the hair until it read OK and I will come back to it when I have finished the rest of the quilting. If I think I can add a little more quilting I will. 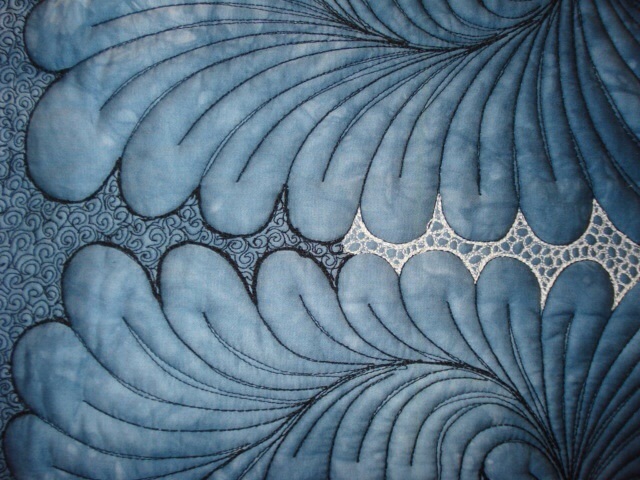 It is one area that really benefits from heavy quilting. Sharon go! 's to Dresden - gone can you find it? 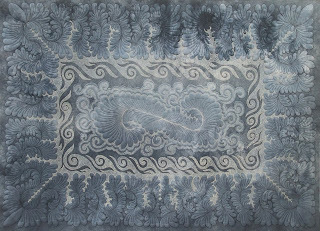 This quilt was designed and made by Simon Henry. 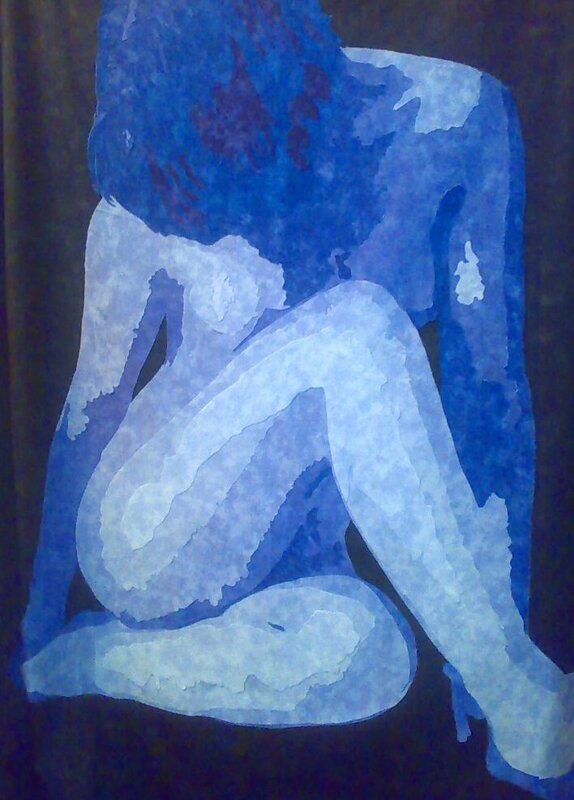 It was hung at the Festival of Quilts at the NEC in Birmingham this year, where it was awarded Highly Commended. It has failed to get home to Derby. It should have been shipped with Expofreight who are looking into it, but at the moment can't find any tracking information for it. I'm really hoping it has just got left on the lorry or something equally daft and easy to do, but who knows. So here is the plea, have you seen it since the exhibition? Any leads would be appreciated. You can contact me, or Simon just click on his name above and it will take you to his web site where there are contact details. Please keep your eyes open and I hope I will soon be able to tell you it's been found. I am quilting the art quilt today but I will leave posting about it until tomorrow, so this has a chance to reach as many eyes as possible, sorry. 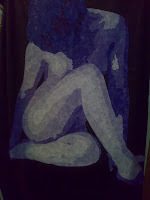 Having done the two urgent customer quilts I can load up my art quilt. 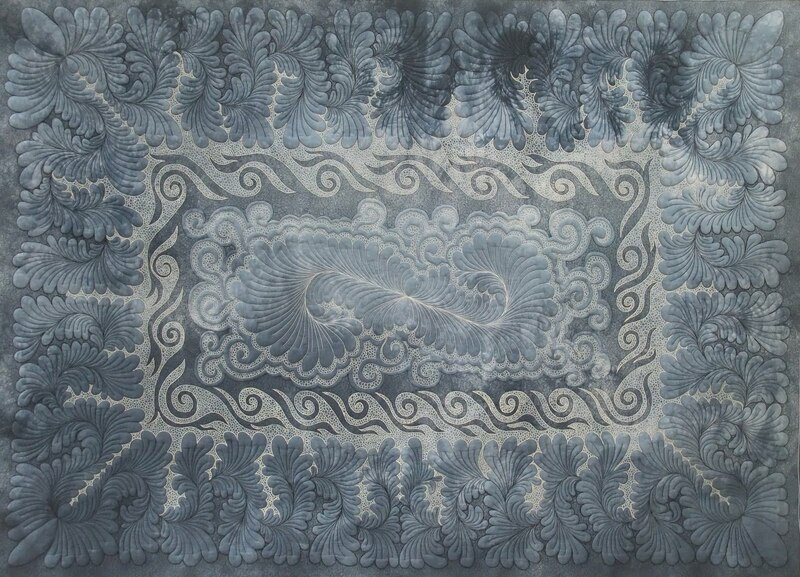 It is getting the same backing as the wholecloth I've been working on, a black floral from Moda. The wadding is the thickest 100% cotton from the dream company, it is really thick and hangs really well as a wall quilt. The floral batik you can see pinned on to the quilt is just there to protect th applique as I work. I float my tops (and even if I didn't normally I would for these) and I don't want to brush against the pieces as I am quilting. 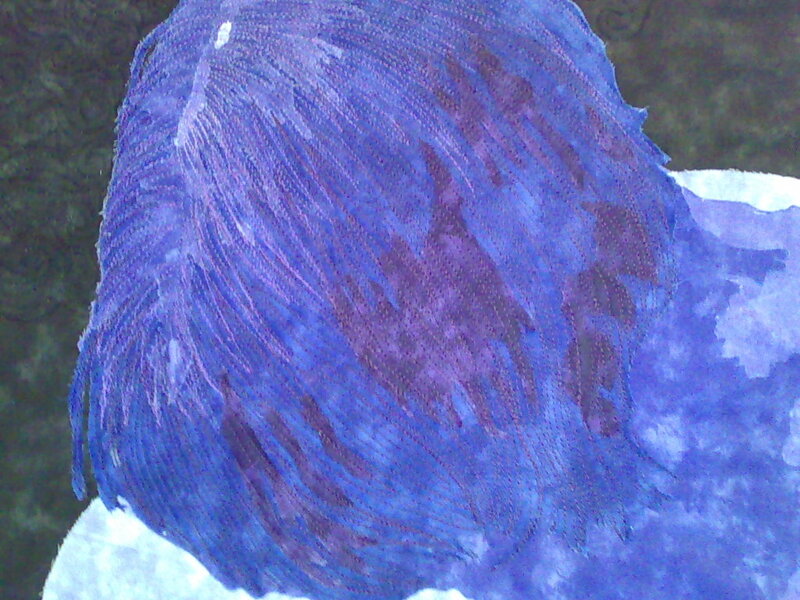 I was thinking I would start right away with the hair as I am happy with that part of the quilt, but then I remembered the other problem with working in purple, threads. 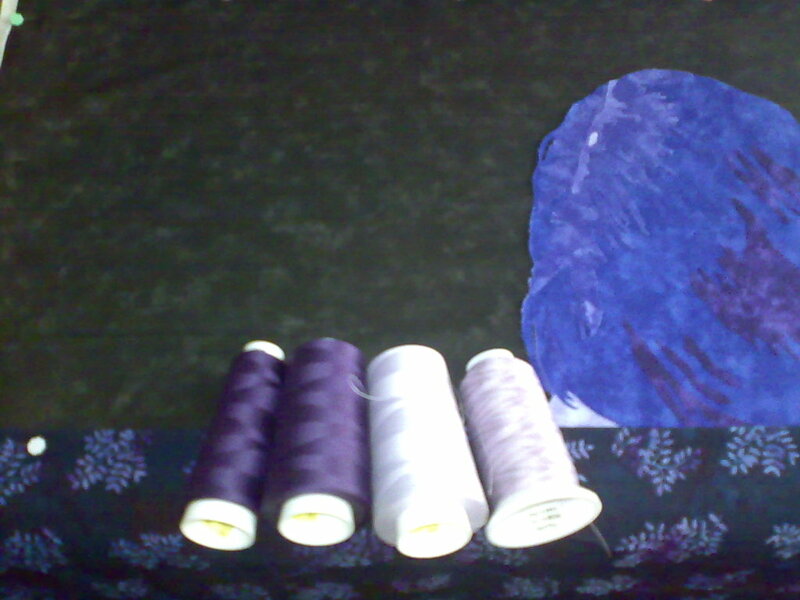 There just aren't enough shades of blue purple thread. 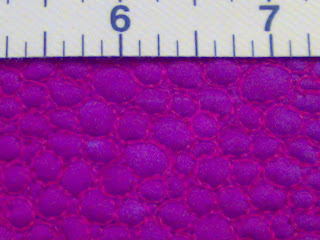 Lots of red purples but those don't match the fabrics I've got. 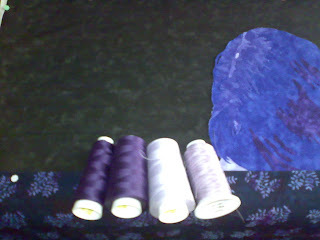 The group of four cones are the quilting weight purples I've got that might work on the quilt. I'm a bit lacking in the mid ranges with them. The set of three are threads I mostly use in the bobbin. I used to use them as top threads a lot then they suddenly stopped working for me. There is a much better range of colours with them, so I think I will have to have another go and see if I can get them to run again, otherwise I think my best option would be shades of grey which do tend to pick up the colours around them so might work in a pinch. Tonight though is a night off, I'm off to see a band with some friends. Maybe inspiration will strike overnight. Thanks to Donna from Follow That Thread, I now have some pictures of Greek Fossils hanging at the world quilt show. I really appreciate it when people around the world not only take and interest in my quilts but also take the time to send me pictures. I can't often go and see my quilts and getting the pictures is rather like getting a good postcard from a friend. In this case it's also the first time I got to actually see the award, doubly good. 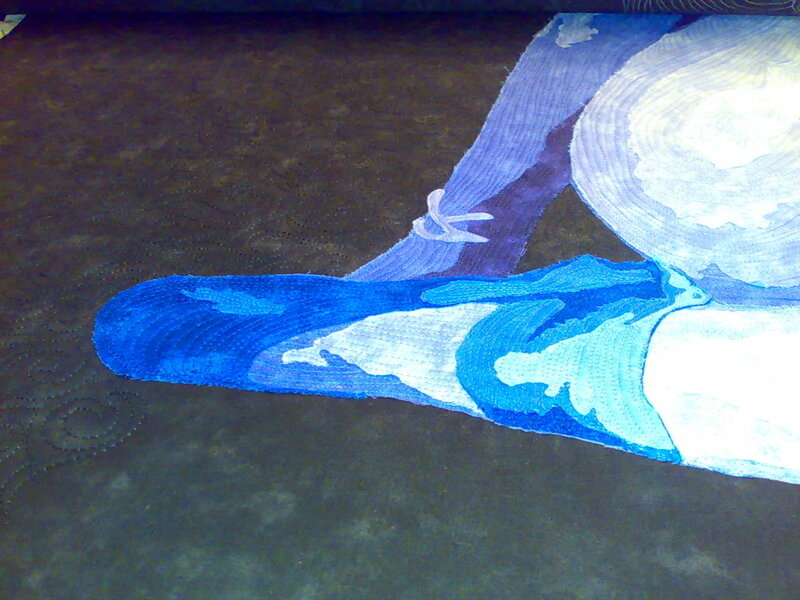 Yesterday I did finish the areas of pebbling I was determined to do before giving the quilt a rest again. I've got a couple of customer quilts I needed to have done and actually they have been a very nice break. There comes a point where you would really like to see some progress when you are working and getting a quilt fully quilted today was just what I needed. I think tomorrow I will finish the customer quilt I have on the frame then start on quilting the art quilt. It's not hanging in a terribly safe place and it should be fairly quick to work on. Before I get to quilting it I do have few tweaks to do but I think they might actually be easier once it is lying down. I know it's not a great photo but it was the best I could do. It's quite a close up, the tape measure is marked in inches. This is a section of the big quilt I am working on and I have 8 sections each about 12" square that I need to fill in with this. The pattern is great for adding the amount of colour I want but it really isn't quick. I am getting faster though and I've just completed the second area. My current plan is to get 4 of the sections completed then unload the quilt and do some customer work. I've got a couple of quilts that are needed for early September. 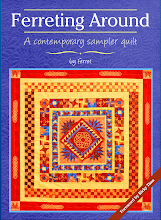 I think I might then look at quilting the art quilt. Anything to let me make bigger movements with the machine to be honest. At least I am about half way with the background fillers so hopefully the next time this quilt makes it to the frame I will finish it. I've ha d a few people ask me about a detail photo of this quilt so they can see what is actually going on in it. Hopefully if you click on the image above you will get a good view. 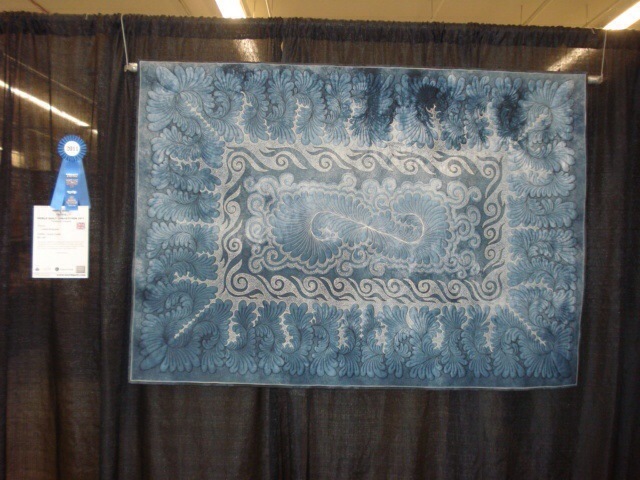 The quilt top is a piece of hand dyed cotton sateen from Heide Stoll-Weber. It is just shades of grey all over. 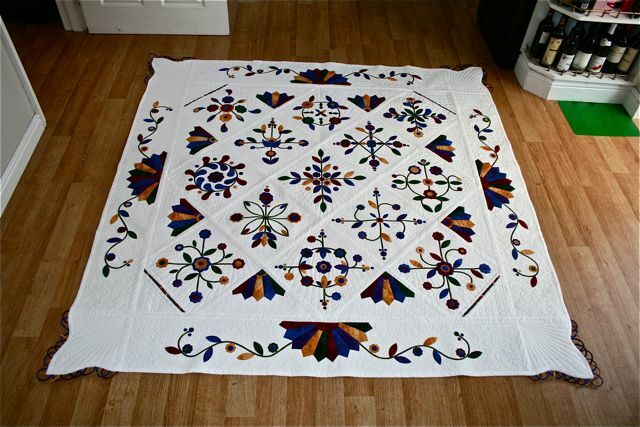 The design comes from the thread, there are two colours in the quilt off white and black. There are 4 cones of thread in this quilt. The wadding is two layers of wool. I love using wool because it has great loft and quilts down to nothing so you can get the trapunto look just from the quilting. This quilt was made to test some ideas I had which I am now using on it's big brother, the monster currently on my longarm frame. The dense fill on this quilt took me about 45 minute to do an area the size of my hand (and no I don't have big hands) fortunately I have got quicker. I never intended it to escape into the world, but I'm glad it did. 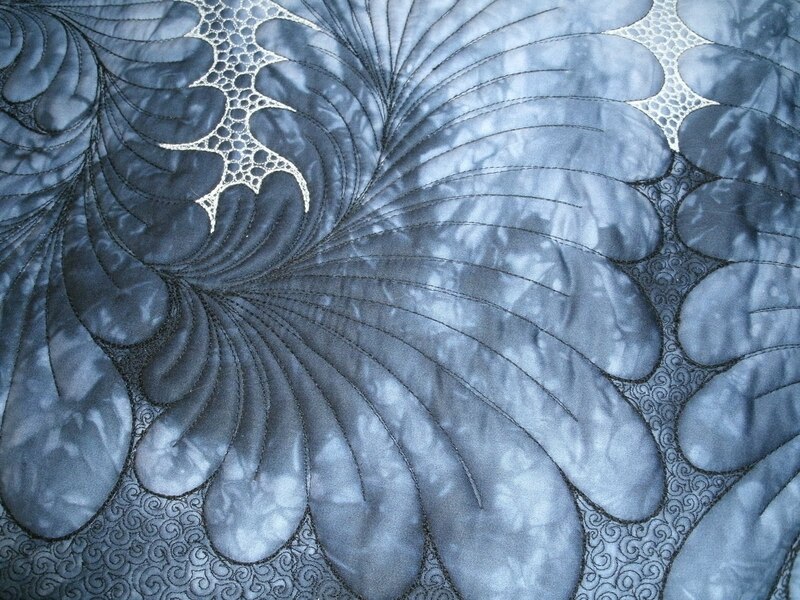 If you have any questions about the quilt do leave me a comment and I will try to answer them. This post should have gone up yesterday but blogger could tell I was using the browser on my phone and wouldn't let me long on to the site it wanted me to email or text in the post, but that often puts the pictures out of order so I decided it was better to wait till today and do it properly. I did enjoy celebrating the World Quilt Show win with sushi last night sorry :) So just pretend it's yesterday. Don't forget you can click on the images for a bigger picture. I just make the thumbnails a bit smaller when there are this many images in a post. The darker of the fist two images is the closest to the right colour, but the brighter one is easier to see so you got both. I got some time to work on the art quilt today. 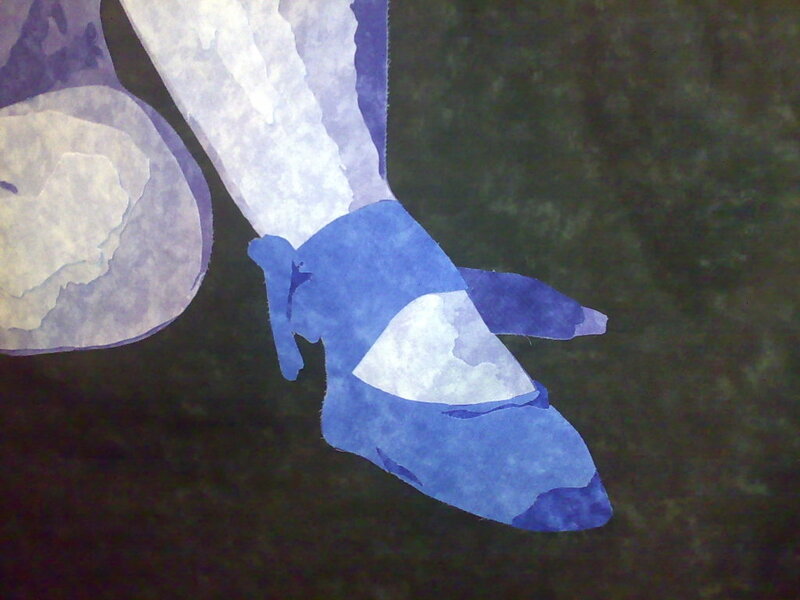 The first job was to finish the leg, it was only a couple of pieces but I think they make quite a difference. Then I needed to get on with her shoes. Maybe having a few days break had it's advantages, I've had time to think about the colour of them. I've ended up going much more subtle than I had been planning. I finally went with blue, see quite restrained. After putting on the first piece I did wonder if I had made the right choice. I started with the darkest shade again. 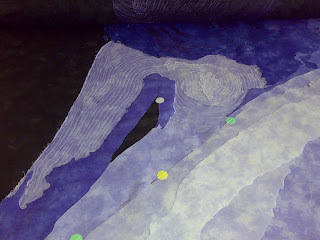 This made sure that any of the purple would be covered and hopefully the blue would be as intense as possible. I don't know that the photos really show how loud it was, but it really did make me wonder. I decided to press on. 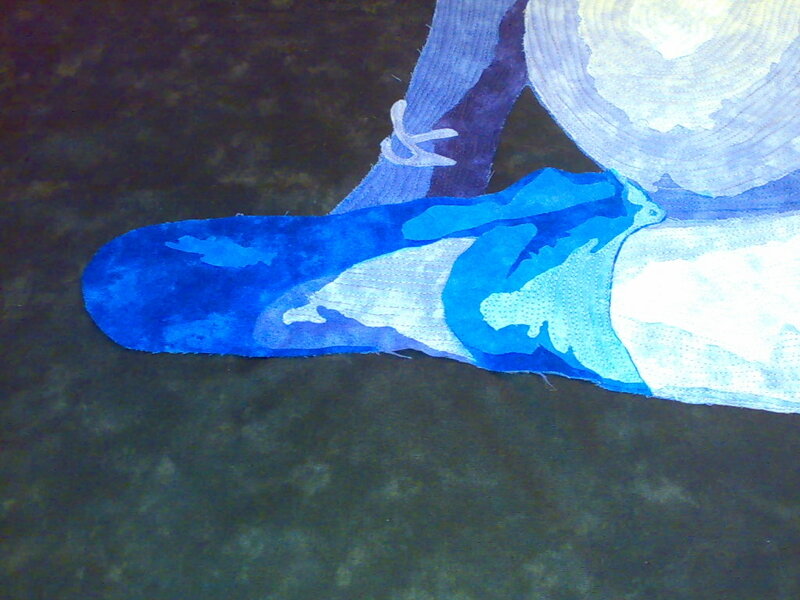 The colours looked good off the quilt so I thought it was worth getting a good look at the effect. If I had to redo this section it wouldn't be too bad. Just adding one shade lighter started to give me hope. I wonder if part of the problem was just seeing such a large block of colour on a fairly complete image. As each layer comes into place the shoes come to life. I love this part, where you can actually see the image appearing. 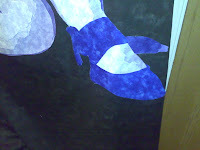 After closing up the sewing room I realised that I had missed at least one piece on her shoes, but that can wait for another day. I will do another check over the whole image. I will look for any pieces that aren't quite the right shade and any details I have missed, then it will be time to quilt it. Yes that's right. My applique is not bonded or stitched until it is quilted. If the frame had been free I would have built to top in situ and quilted as soon as an area was laid in place. I find this method gives me the softest thinnest quilt, which for these is what matters to me. My latest thread order has just arrived, yummy isn't it. 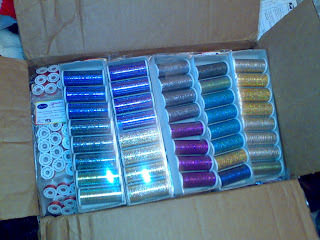 Believe it or not most of the box is full of prewound bobbins. Yeah that's quite a few bobbins, but with cotton prices rising and shipping cost going the same way it makes sense to stock up. I do find it odd how much Kelly Green I get through. I had to get prewounds and a cone to be sure I would have enough. I really like the new blues that arrived. I'm sure they won't last long. I also got a supply of Glitter thread for my machine quilting classes, it's been one of the most popular threads I demo with so I can now offer it for sale to my students. I can't afford to keep all the shades but I hope I got a good selection. Well back to the art quilt. I'll show you how I'm doing later. I've had a couple of days with very little time to quilt unfortunately (well it happens). I did errands yesterday and visited a friend today. When I got home though I got a great surprise. The World Quilt Show results are up. Well where to start. At the top I guess, Persephone Rising by Marilyn Belford I love. I am surprised it only have an Honourable Mention. I love it, but I usually do like her quilts. Heading on down the page I like the Winner of Best Machine Workmanship (Innovative) I hope I can get to see a bigger picture of it at some point. It is Te Timatanga by Ansa Breytenbach, from New Zealand. My next big grin was caused by Jacquie Harvey,who has won Best Hand Workmanship (traditional) with Lux Aurumque (Light & Gold. I have huge respect for Jacquie and she is a lot of fun too. Well done. Right below her quilt is Best Machine Workmanship (traditional), Greek Fossils :) I can't tell you have chuffed I am. That was the award I really wanted, but the good news continues, best of country for the UK is another quilt I am really fond of, A Future and a Hope by Lynne Quinn I saw it at the Festival of Quilts last year and loved it. I felt it should have done better than it did, and this pretty much sorts that out. All in all a great day for lots of quilts and people I like. 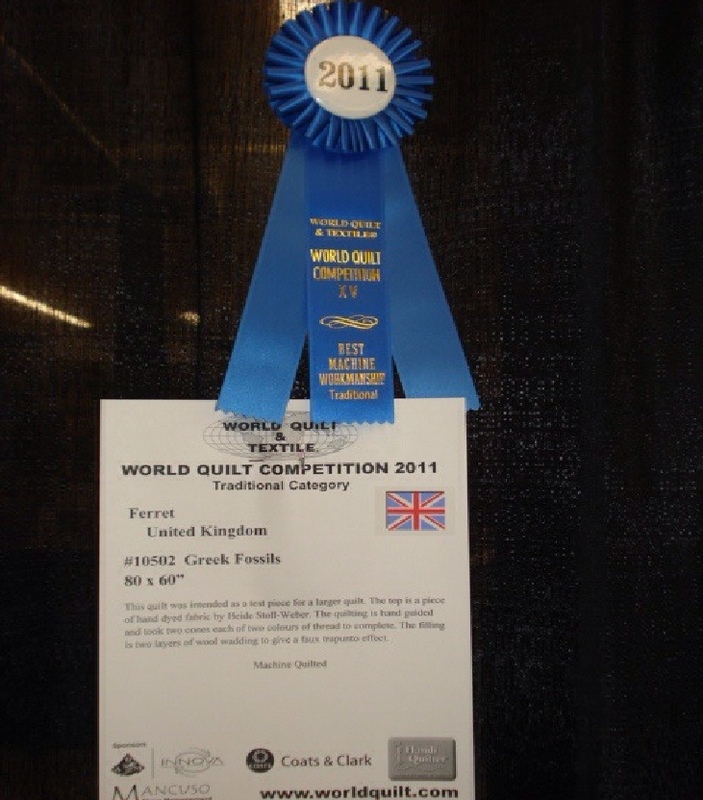 Well done everyone and if anyone is going to the World quilt show at any of it's venues please could you send me a picture of Greek Fossils hanging, I would really appreciate it. Maybe it doesn't quite have the same ring as the end is nigh, but I think it is pretty cool. This is the monster quilt and that really is the middle. I've been working from the bottom up doing the fill quilting, and I don't get to roll on much so milestones become way more important. I still haven't done all the filling and there will probably a third pass, but it is coming along. I've not got as much done today. I've managed to catch up on some sleep and Tet got back from his weekend music festival so I've tried to be a bit sociable. 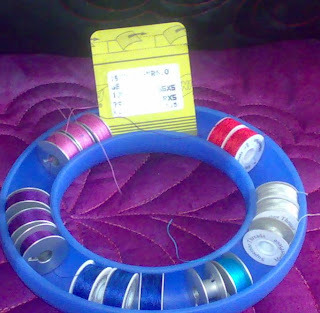 Being a sad quilter I thought I would share my ring of bobbins today. I have several of these rings and I love them as the bobbins don't fall out when you drop them on the floor, and well I do that from time to time. This one is just set up for the current project which not only has several colours of bobbin thread in it but gets through quite a lot of all of them. 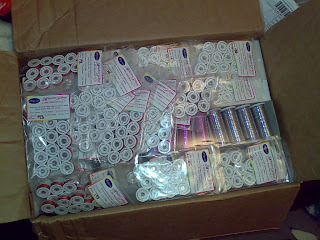 As you can see I am using a mixture of pre-wound cardboard bobbins and ones I wind myself. 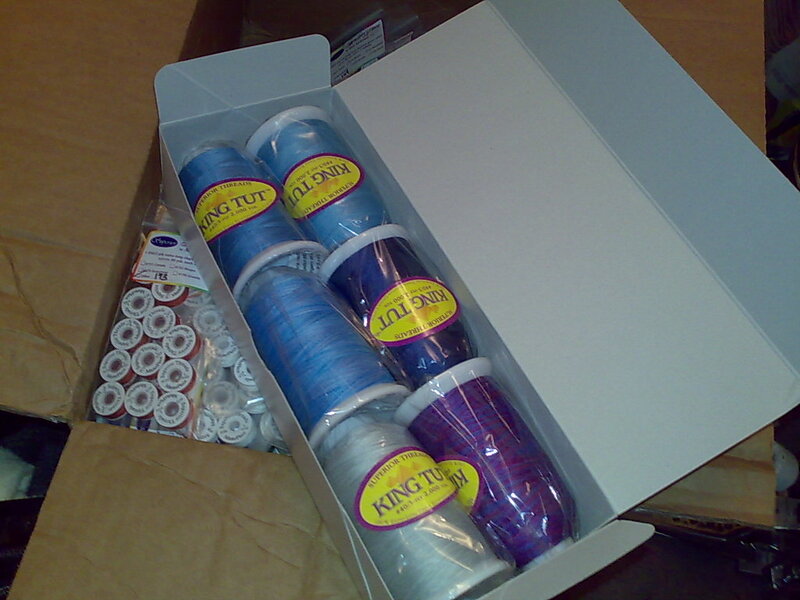 Most of the thread is Masterpiece by Superior threads, it's a very fine (50wt) cotton thread. 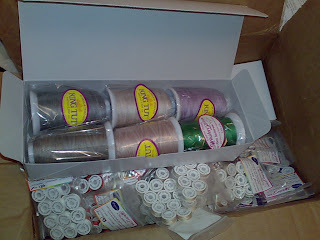 The dark purple is Aurifil. 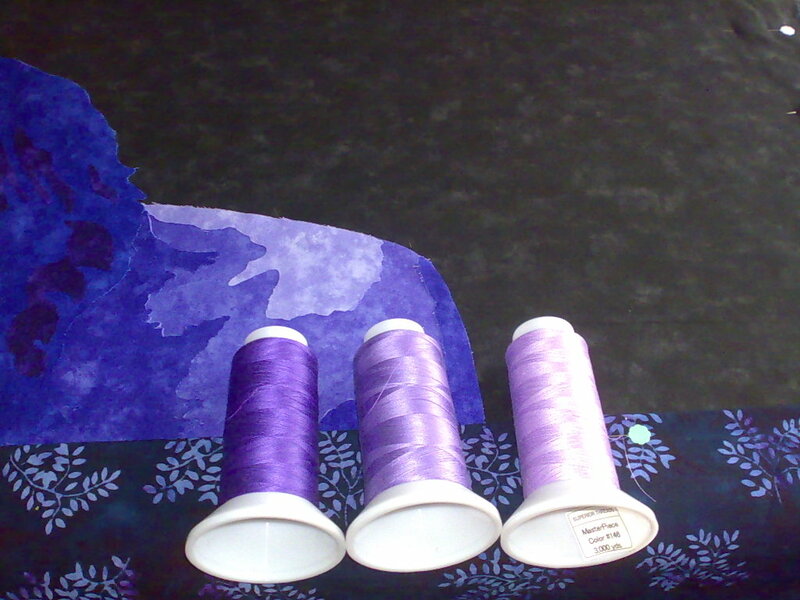 That is also a 50wt cotton and is the bobbin thread for the matching shade of 28wt that I am using on the top of the quilt. 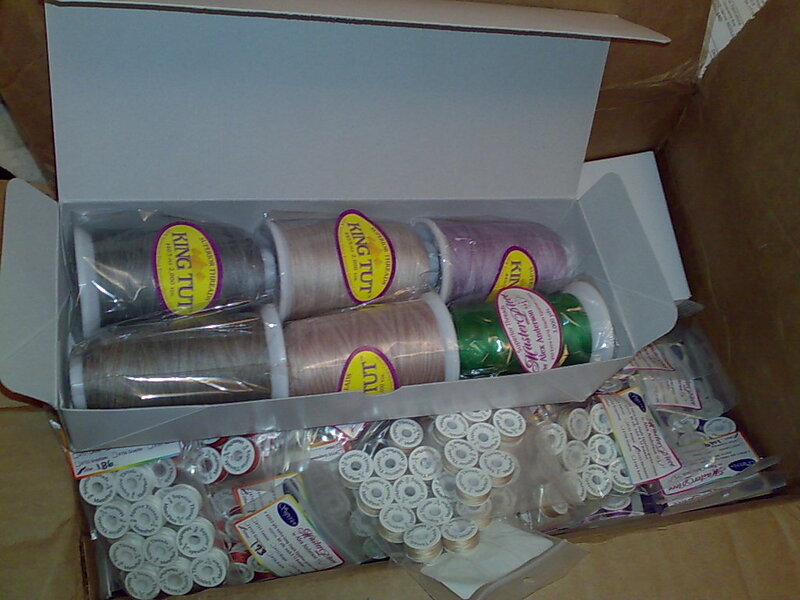 I just really like seeing my bobbins sitting there waiting to be used. I don't generally have needles waiting to be used, but this is pretty dense quilting and I am getting through needles pretty quickly. Having them right to hand improves the odds of me changing them as soon as they need it.